Packaged FINDINGS: Flexible Packaging…Naturally More Or Less? Flexible packaging has been making huge inroads in food packaging and for the most part, has generally improved modern day life. Innovations in single-use applications, especially in baby or children’s food packaging have changed packaging standards for a category. 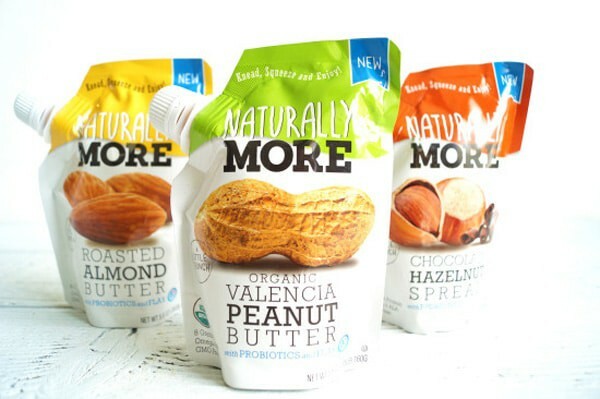 Because I like to highlight the new and different in packaging, I was super excited to see the pouch format for Naturally More Organic Valencia Peanut Butter. Here was one of my favorite foods presented in a re-sealable, spouted pouch. The graphic design was well done – simple, clean, straightforward and uncluttered. The brand, which was new and not related to one of the major brands already on shelf, was well represented by a font designed to look like natural printing as a reflection of a “natural” product. While the major brands featured peanuts on their package, this product relied on one strong nut image used almost as a super graphic or icon to identify the product. The package hierarchy was very linear and clear-cut in order of importance ranking the critical messaging, identifying the brand, product variety, and comfortably positioning the key benefits story on the back panels. The well-organized system provided maximum continuity as the product styles changed from package to package, resulting in a strong visual branding system – so far, so good. Everything was set up so that if or when the brand wanted to add products or style variants to the product line, they could do so without reinventing the wheel. As a new product on shelf, it presented an exciting fresh approach to peanut butter packaging that I was eager to try. It was at this point that I discovered the idea had to go back to the drawing board. Being a fan of peanut butter, I understood that every now and then you have to reblend oils that naturally separate from the peanut solids. I did read and follow the instructions on the pouch that said to “Knead, Squeeze and Enjoy.” To my dismay, I was presented with separated peanut oil – everywhere – including down the front of my shirt. And if that wasn’t enough, once open, the pouch continued to leak oil – whether the package was in an upright or flat position. Perhaps I am being a little reactionary, but whatever value there is in having a pouch of nut butter is gone, and it’s unlikely I will give it another try – at least in this format. Unfortunately, this experience creates doubt about the utility of similar spouted pouch packaging. Here is a situation where no amount of well-designed graphics on a package can overcome poor structural functionality. The consumer experience never got to the tasting of the product before throwing the package away. Daring to be new or introduce a new packaging idea is risky, to begin with, but a thorough understanding of your structural limitations should always mitigate it as you initiate putting a new product on shelf that consumers will embrace. In this case, I recommend the Naturally More team go back and re-evaluate their structural effectiveness or look at alternative or hybrid packaging styles. Most of all, be aware that when the package gets in the way of a positive consumer experience, the only option is to go back to the drawing board and start over, which unfortunately is not very cost-effective. The purpose of our “findings” blog is to spotlight packaging that displays thinking that breaks the mold, delivers something new or chancy – or at the very least – highlights packaging that catches your eye in the retail environment.